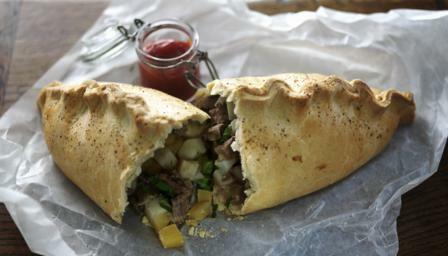 Try the Hairy Biker's recipe for a classic steak pasty - these are great to make ahead for a party or picnic. Meanwhile, for the filling, bring a pan of salted, boiling water to the boil. Add the chopped swede and potato and cook for 4-5 minutes, until tender, then drain well, refresh in cold water and set aside. Roll the chilled pastry out onto a clean, floured work surface. Cut a large disc from the pastry using a dinner plate as a template. Place the onions in a line down the middle of the pastry disc. Spoon the chopped steak on top, then spoon the cooked potato and swede over it. Sprinkle with the chopped parsley and season, to taste, with salt and freshly ground black pepper. Brush the edge of the pastry disc with some of the beaten egg. Draw the edges of the pastry together and crimp them with your fingers to seal so that the seal sits on top of the filling. Using a knife, make a small hole in the top of the pasty and brush all over with the remaining beaten egg. Place the pasty onto a baking tray and bake in the oven for 25-30 minutes, or until golden-brown.